"If we don't have it, we can get it. Give us your price to beat!" Our system is easy. Email us with our catalog order #, name of the item(s) of interest, cost if listed, and your shipping address. If you don't see it in our catalog, simply email us a .jpg of what you want. We will confirm the availability, length of production, and the target shipping date from China. Time Zones: Our Beijing Office is on the opposite of side of planet with only a tiny window of live communication time to USA. It might be the next day before your questions are answered. Sorry, but we do NOT sell retail. Please visit your local store, wholesaler, trade show, or another URL. 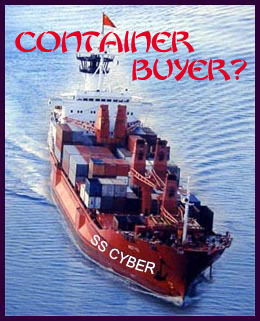 If they don't carry what you want, suggest that they contact Cyber Import. Samples are not free. Like most factories, we also carry no inventory. If you need samples, and we can get them pre-production, you might be charged a premium cost. Upon receiving your confirmed factory order, a rebate will be given for any difference. Sometimes a "mold fee" is necessary. This mold fee is often refundable after ordering an accumulative total of goods that is specified by the factory. Our many products, factories and pages make it impossible to keep all prices current. Inventory is not stocked at fixed price. Other challenges include: Fluctuating commodity markets, rising labor fees, uncertain oil costs, rapidly changing China RMB exchange rates, quantity needed, and the simple failure of factories to update us. If a posted price appears high, please still contact us. Every order inquiry is reconfirmed with the factory before pro-forma invoice quotation. Some prices even go down, especially within industries such as electronics. Current price is confirmed with factory by the next day, at which time the catalog page is updated. Payments that can't be filled at the quoted price will be refunded. Any import/export inquiry is most welcome. Larger orders are more easily filled. Shoestring budgets are sometimes unrealistic depending upon the industry. We do serve shoebox-sized buyers when possible. As a general trading company we can develop product and ship to any point on the planet. Knockout combination of high quality and low prices. This catalog is only a tasty sampler of the vast Chinese treasure chest that we produce or can source for you. You don't need any kind of re seller sales permit, certificate, or ticket to be our international dance partner. We trade with anyone. No matter if you are a push-cart vendor, flea marketer, mom and pop operation, Internet mail order, super warehouse, chain store, or the gorilla of your industry. The larger the order, the more competitive our dance step. We enjoy dancin' with gorillas. However, don't be too shy to cut in.